Photographer Gray Malin is famous for his sweeping yet playful aerial shots, capturing vistas ranging from Aspen to Rio to the Côte d'Azur. His latest landmark? The Rockefeller Center Christmas Tree! On November 8 he released a limited-edition print of the subject, which is the first licensed fine-art image of the Tree available for purchase. With its surprising point of view, taking in the surroundings of the Plaza and the NYC skyline, the image shows the iconic evergreen in a new light. We spoke with Malin to find out more about his unique perspective on the Tree. 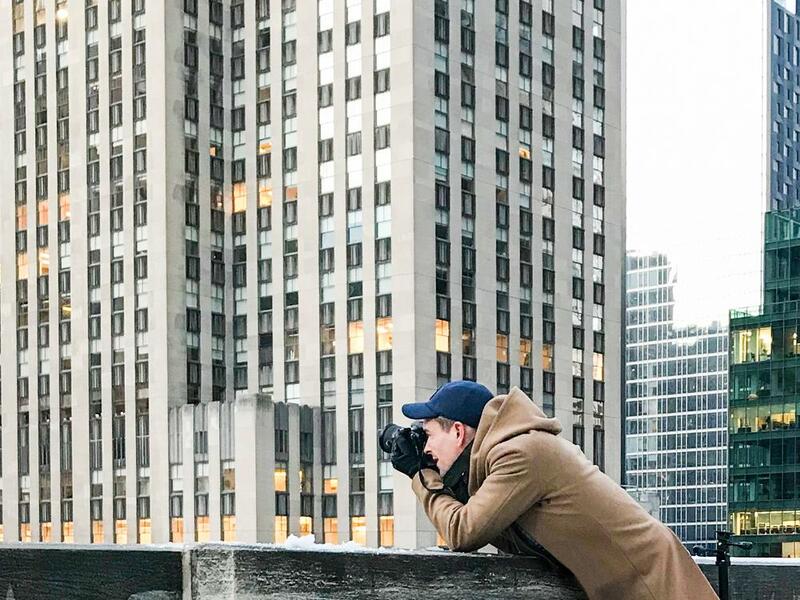 How did you achieve this shot of the Rockefeller Center Christmas Tree? I shot the Rockefeller Tree from the rooftop of Saks Fifth Avenue on a 6-foot tall ladder (with my team tightly holding the legs because we were on ice!). This shot was especially magical because I was able to shoot it the evening after the first snowfall of the season. What fascinates you about the aerial perspective on the Tree? Was it important to you to see the scene in the larger context of NYC? Capturing an aerial perspective of the Tree was especially interesting to me, as it is unexpected. We're all accustomed to seeing photos from a first-person point of view, as if you’re standing perfectly centered in front of it. In reality, though, the Tree and its surroundings are busy and vast, just like New York City itself. I wanted to capture how monumental it is, that a sparkling tree in the middle of a crowded city night manages to command a presence of celebration and joy, regardless of the hustle and bustle going on around it. Did you discover anything you didn't anticipate while shooting it? It was snowing in New York earlier in the day so the rooftop was pretty slippery with melting snow and it freezing outside. This was definitely something we had to work around, but the snowfall on the buildings’ rooftops made it worth the while. I also loved the pattern the skaters were making while skating on the rink. Patterns formed by nature and people often play a part in your photographs. Do you see a relationship between the Tree and its lights, and the way people arrange themselves on the Promenade and the Rink? Yes, whether I'm photographing a beach scattered with sunbathers and beach umbrellas or skiers jetting down a snowy mountain, I am constantly inspired by the patterns that people within their surroundings organically create from high above. It was no different when it came to photographing the Tree. From the composition of the towering buildings, to the skaters sparkling atop the ice rink, to the visitors scattered along the Channel Gardens, these combined to create a beautiful scene that flowed like a holiday song melody. Were you drawn to the rooftop pools, too? The pools certainly captured some of my attention, however from my special point of view, I found myself being especially drawn to the Channel Gardens. There is something very subtle yet stunningly beautiful about a garden in the wintertime. You mentioned happy memories of seeing the Christmas Tree Lighting on TV as a kid. How did it feel to photograph it for this project? It was surreal. Not only did I grow up watching the tree lighting ceremony with my family, I also was an avid movie watcher, especially during the holidays! One that was especially poignant was Home Alone 2. The idea of getting lost in New York City was so scary, yet exciting! The Rockefeller Center Tree plays a really special role at the end of that movie, as Kevin ends up at the base of the tree and wishes to be reunited with his family. Then in true movie magic fashion, his mom appears. What feelings do you hope to spark in viewers of the photo? Regardless of where you live or what you celebrate during the holiday season, the Rockefeller Center Tree is synonymous with joy and celebration, so that’s what I hope this image evokes no matter what time of year someone sees it.